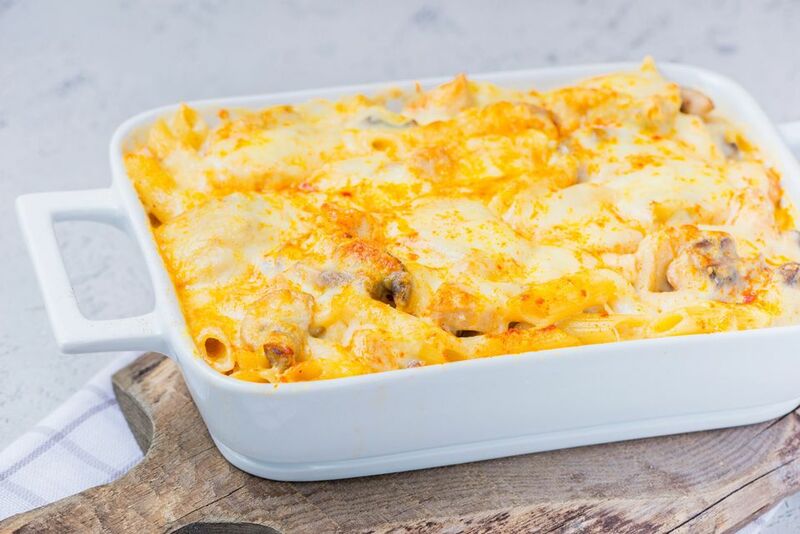 Lots of melty cheese and a simple sauce brings this chicken and pasta together for a tasty and satisfying family meal. Artichokes and mushrooms add nutritional value and texture to the dish. Feel free to adapt the casserole ingredients with what you have on hand and to suit your tastes. A combination of mozzarella and cheddar cheeses—or a pizza blend—is a good alternative to all mozzarella. While there's no good substitute for the earthy flavor of mushrooms, they can be replaced with another vegetable; add about 1 cup of sliced celery or onions to the skillet and saute it along with the chicken. Steamed sliced asparagus, broccoli, peas, or mixed vegetables are suitable replacements for the artichokes. For extra color, consider a few tablespoons of chopped pimiento or add about 1/4 to 1/2 cup of diced red bell pepper to the skillet along with the chicken. The casserole makes a fantastic dinner with a Caesar salad or spring greens. Toast some garlic bread to go with the meal and enjoy! Grease a 2- to 2 1/2-quart baking dish. Cook the penne pasta in boiling salted water following package directions. Drain in a colander and set aside. Heat the olive oil in a large skillet over medium heat. Add the chicken, mushrooms, and Creole seasoning. Cook until the chicken is thoroughly cooked and the mushrooms are lightly browned, stirring frequently. Remove the chicken and mushroom mixture to a bowl and set aside. Melt the butter in the same skillet and add the minced garlic. Cook, stirring, for about 1 minute. Blend the flour into the butter mixture until smooth and bubbly. Continue to cook the flour and butter roux for 1 minute, stirring constantly. Add the milk and chicken broth and continue to cook until thickened, stirring constantly. To the sauce, add 1 1/2 cups of the Mozzarella cheese and about half of the Parmesan cheese; cook until the cheese has melted, stirring constantly. Stir in the chicken and mushroom mixture and the artichokes. Taste and add salt and pepper, as needed. Combine the sauce and pasta; transfer to the prepared baking dish. Sprinkle with the remaining cheeses and sprinkle lightly with paprika, if using. Bake for about 20 to 30 minutes, until lightly browned and bubbly. Make It Ahead: Prepare the casserole as directed, but do not bake it. Cover the casserole with foil and refrigerate for up to 24 hours. On baking day, remove the casserole from the refrigerator and let it stand at room temperature for about 20 minutes. Preheat the oven to 350 F and bake the casserole, covered, for about 35 minutes. Remove the foil and bake for about 10 minutes longer, or until the casserole is hot and bubbly.